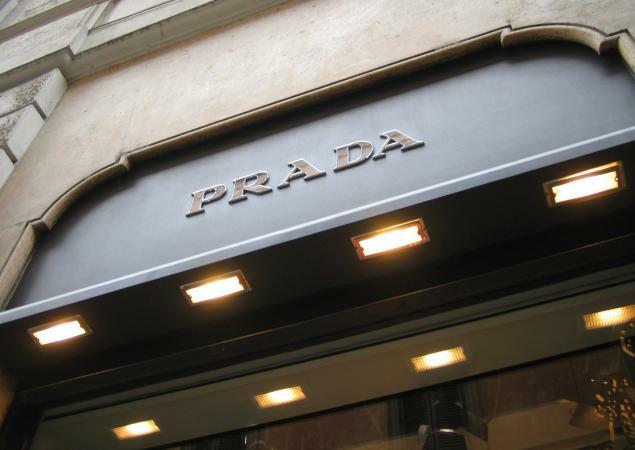 Prada was founded in Milan in 1913 by Mario Prada as a luxury leather-goods firm, but it made little impact on the world of fashion until after Miuccia Prada took charge of her grandfather's company in 1978. Her first big success was a black nylon backpack with a triangular silver label. Soon her shoe and handbag designs became the focus of a veritable cult of fashionable consumers in Europe, America, and Japan. Miuccia Prada and her husband and business partner, Patrizio Bertelli, maintain close control over the company. They added a ready-to-wear line in 1989 and inaugurated the younger, slightly less expensive Miu Miu line in 1992, followed by Prada Sport, whose iconic red line is almost as recognized in certain circles as Nike's swoosh symbol. A string of shops and boutiques in Paris, New York, and San Francisco, designed in collaboration with the architect Rem Koolhaas, became instantly famous. Prada also engaged in a series of complex ownership maneuvers in the late 1990s, buying and selling stakes in Gucci, Fendi, and other companies and forming a partnership with Azzedine Alaïa in 2000. Prada clothes and accessories have been described as both classic and eccentric, frumpy but hip, marked by an ambiguous techno-retro sensibility. On the one hand, Prada's style is modern, drawing on northern Italian traditions of discreet elegance and fine craftsmanship. On the other hand, as Miuccia Prada said in 1995, "I make ugly clothes from ugly material. Simply bad taste. But they end up looking good anyway." She may have been referring to that season's "bad taste" collection, featuring such styles as a Formica check design, which evoked the look of 1970s polyester. Several years later she said, "I have always thought that Prada clothes looked kind of normal, but not quite normal. Maybe they have little twists that are disturbing, or something about them that's not quite acceptable. … Prada is not clothing for the bourgeoisie." The eccentricity and intellectual purity of Miuccia Prada's clothes appeal to intellectuals and artists, while fashion editors are drawn to her constant experimentalism. Prada produced very strong collections in 2003 and 2004 that reaffirm her own aesthetic sensibilities and the stature of her company. See also Alaïa Alaia; Fendi; Gucci; Handbags and Purses; Retro Styles; Shoes.